The world is full of micro-organisms (including bacteria) and so are people's bodies - in and on the skin, in the gut and in other orifices. "Healthy Bacteria" are vital to proper development of the immune system, to protect against micro-organisms that could cause disease and to the digestion and absorption of food and nutrients. Each person mix of bacteria varies. Interactions between a person and the micro-organisms in his/her body and among the micro-organisms themselves, can be crucial to the person's health and well-being. Probiotics are live micro-organisms (in most cases, bacteria) that are similar to beneficial micro-organisms found in the human gut. They are also called "Friendly Bacteria" or you may called it "Healthy Bacteria"
Most probiotics are bacteria similar to those naturally found in people's gut, especially in those of breastfed infants (who have natural protection against many diseases). 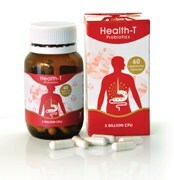 Health-T Probiotic is a health supplement product that designed to suite most peoples . Especially those who are highly stress, weak immune system, diarrhoea, irrtable bowel syndrome, lady's urinary tract infection (white discharge problem) etc. This product made at a manufacturer with GMP (Good Manufacturing Practice) status in Malaysia.